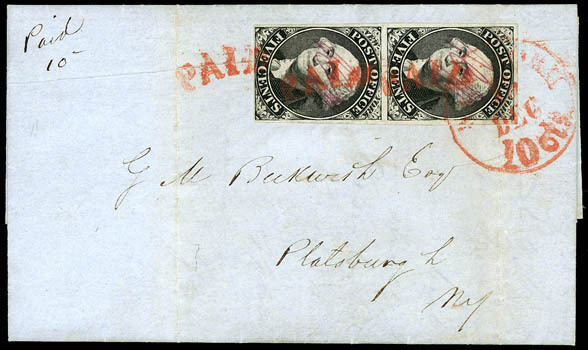 New York, N.Y., 5¢ black on bluish, vertical pair, ample to large margins, tied by red "New York, 10cts, Dec 15" cds arched "Paid" handstamps on 1846 folded letter to Platsburg, N.Y.; file fold crease in top stamp, Very Fine appearance; with 1984 P.F. certificate. Scott No. 9X1 Estimate $400 - 600. 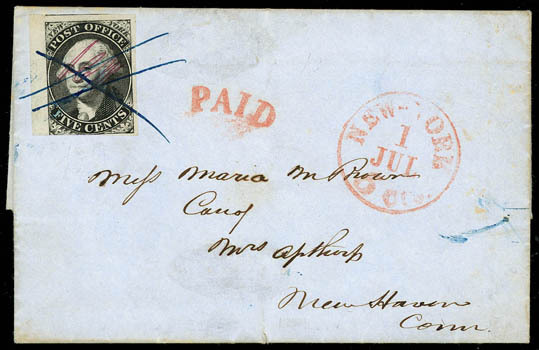 New York, N.Y., 1845, 5¢ black on bluish, position 16, left sheet margin single with huge margins to just in at bottom, tied by blue manuscript cross-hatch on 1846 blue folded letter to New Haven Conn. red "New-York, 5cts. 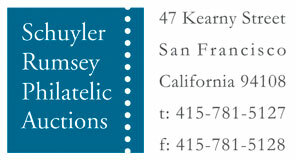 1 Jul" cds and matching "Paid" in arc handstamp, F.-V.F. 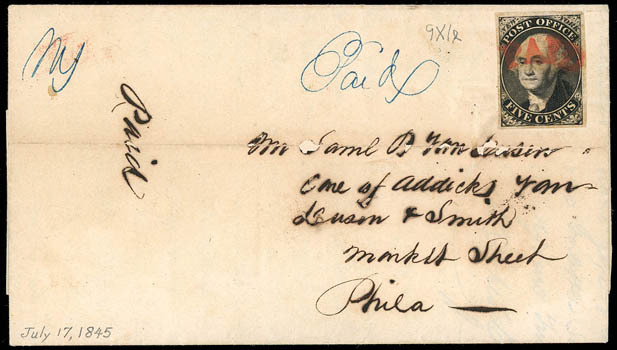 New York, N.Y., 1845, 5¢ black on bluish, without signature, position 10, large to full margins all around, cancelled by red "Paid" arc handstamp, small bit of New York cds at left with blue manuscript "NY" written on top, matching blue manuscript "Paid" on folded letter datelined "New York July 17, 1845" to Philadelphia Pa.; light overall toning and some ink erosion in address, Fine and early use, ex-"Golden Oak". This cover is used only two days after the July 17th earliest known use. 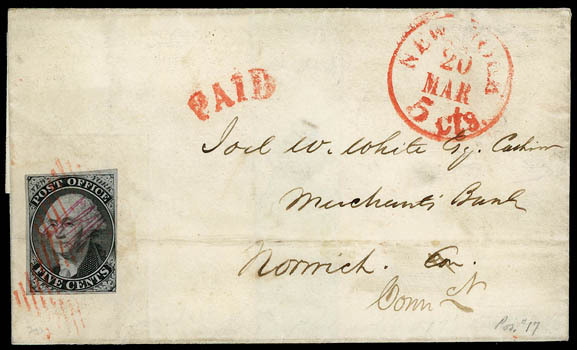 New York, N.Y., 1845, 5¢ black on blue, position 17, deeply blued paper, margins large to just touching at lower right, tied by red square grid handstamps on 1847 folded letter sheet to Norwich, Ct., matching "New York, 5cts, Mar 20" cds and arched "Paid" handstamp; horizontal file fold affecting stamp, Very Fine appearance, a rare on cover usage of the New York Postmaster's Provisional 5¢ on Blue Paper, ex-Consul Klep; with 2006 P.F. certificate.